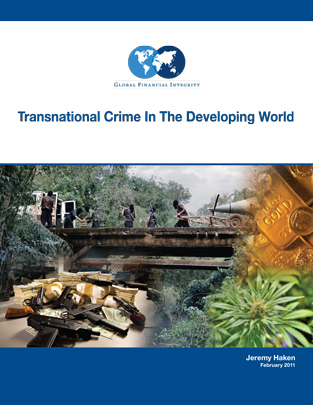 This February 2011 report from Global Financial Integrity, “Transnational Crime in the Developing World,” finds that the illicit trade in “goods, guns, people, and natural resources” is a $650 billion enterprise, which most negatively impacts the developing world. The study evaluates the overall size of criminal markets in 12 categories: drugs, humans, wildlife, counterfeit goods and currencies, human organs, small arms, diamonds and other gems, oil, timber, fish, art and cultural property, and gold. The global illicit flow of goods, guns, people, and natural resources is estimated at approximately $650 billion. Though data is scarce and experts are constantly debating the relative merits and weaknesses of every new study, it is generally accepted that illicit drug trafficking and counterfeiting are the two most valuable markets. This report finds the illicit drug trade to be worth roughly $320 billion and counterfeiting $250 billion. These numbers reflect the potential for huge profits which is the fundamental driver of criminal trade. Of the 12 illicit activities studied, trade in drugs ($320 billion per year) and counterfeiting ($250 billion per year) were ranked first and second in terms of illicit funds generated. The second key finding is that profits from illicit markets are funneled mainly to the transnational crime syndicates who establish and maintain vast trade networks. In source countries, though forced labor is known to occur, laborers are generally paid. Their rates, however, make up only a tiny fraction of the overall profits derived from the trade. In supplying cocaine to the United States, for example, coca farmers in South America make less than two percent of the final retail value. In the case of organ trafficking, a kidney donor often makes less than $5,000, while the trafficker could net as much as ten times that amount. These traffickers operate in complex networks which include everyone associated with the production, transport, and sale of an illicit good; from the laborer, to the corrupt customs official, to the migrant worker who offers illicit goods or services in New York or London. In some cases, like gold, diamonds, and cultural property, the origins of a good must be obscured so it can enter the legitimate market. This often involves the falsification of paperwork and a buyer who is either complicit or simply avoids asking too many questions. The final and most critical point is that criminal networks, which function most easily where there is a certain level of underdevelopment and state weakness, have very little incentive to bolster the legitimate economies in the countries where they operate. Unregulated, they minimize overhead in developing source countries by exploiting local labor forces, often resorting to forced or child labor, dodging environmental and safety regulations, and evading trade tariffs. Any improvements in economic development and governance would usually hinder their illegal activities, so it is in their best interest to actively prevent their profits from flowing into legitimate developing economies. In this way, transnational crime and underdevelopment have a mutually perpetuating relationship.